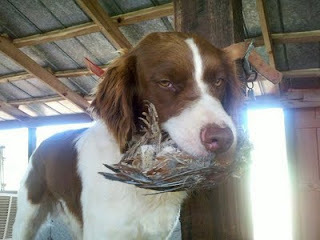 A Bird Hunter's Thoughts: It's force-fetch time! It's a long summer and I have plenty of time to do this, so, here we go! Here's my pup, Cap, about 11 mos. old, on the training table. He is really taking right to the training, which surprises me. My other pup, Ruby, is much more tentative. Of course, that is the personality difference between them, too. I'm pretty sure she won't be quilled or skunked next year, either. Cap, on the other hand,.......well, he's got a little of that "ready, shoot, aim" mentality. I'd lay odds, he'll jump in on a skunk in a heartbeat. It's a good thing I keep pliers and antibiotics on hand for the porcupines and the skunk elixir ready to go (hydrogen Peroxide, baking soda and dish soap).